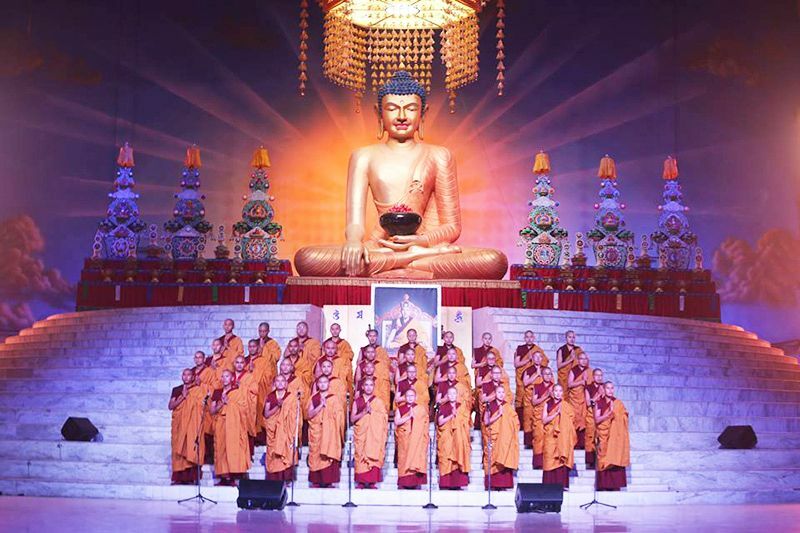 On this very special morning of the full moon in the Miracle Month, the first of the Tibetan New Year, the Gyalwang Karmapa visited the Mahabodhi Stupa in the early morning to offer a lucent, golden set of robes to the Buddha and ten alms bowls filled with a variety of fruits and jars of honey. 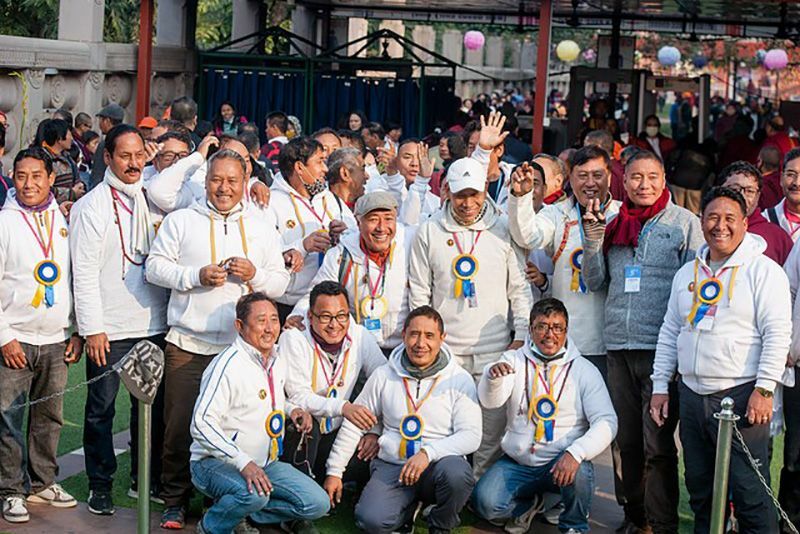 Creating an auspicious connection, he gave ordination to some twenty-one people in the inner shrine chamber of the stupa. Walking back out the central aisle, lined with people offering katas and flowers, the Karmapa circled around the stupa to the backside where lamas were performing a puja under the Bodhi Tree. He sat on a throne under its spreading canopy to join in the chanting, dedicated for the spread of the Buddha’s teachings throughout the world. The Karmapa then returned to the Pavilion to lead the practice of Offering to the Gurus—a fitting conclusion to the seven days of practice at the Kagyu Monlam. Appropriate to the text, which enumerates one generous offering after another that pervade all of space to its farthest limit, the shrine was filled with rows of bountiful offerings—colorful fruits, the eight auspicious symbols and the seven royal possessions all in silver and, at the top on either side, two wide pyramids of texts wrapped in maroon and yellow. The ground of all excellence in this and future lives, the root of all paths, the best means of progress, the guide to higher rebirth and liberation, and the source of all instruction is the guru, the spiritual friend. If you know the reasons why this is so and have appropriate devotion, you will see the meaning of the dharmata. 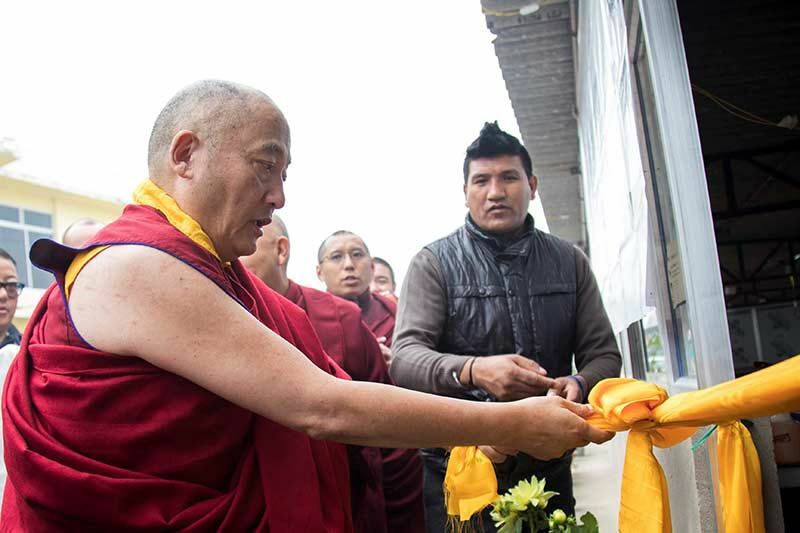 In a touching gesture of open-hearted devotion to another lineage, the Karmapa focused this morning’s practice on the two great Nyingma masters who recently passed away: Khyabje Chatral Sangye Dorje Rinpoche and Khyabje Taklung Tsetrul Rinpoche. Their images were placed in the center of the wide shrine and the Karmapa made deeply respectful offerings to them. Khyabje Chatral Rinpoche was a scholar and special master of Dzogchen, who realized the supreme yoga of the four appearances. The previous HH Dudjom Rinpoche called him, “The Vajracarya, the All-pervading Lord.” He had disciples from all over the world—in every area of Tibet as well as in other parts of the East and the West—in whom he planted the seed of liberation. Khyabje Chatral Rinpoche encouraged everyone not to kill animals and to be vegetarian; he was famous for the practice of saving lives and passed away at the age of 105. Kyabje Taklung Tsetrul Rinpoche was the sixth supreme head of the Nyingma tradition. The previous HH Dudjom Rinpoche said of him, “He is the great chariot of an ocean of the Buddha’s teachings in both the sutra and secret mantrayana traditions.” Khyabje Taklung Tsetrul Rinpoche held and spread the Nyingma tradition of the Northern Terma. In Simla, Himachal Pradesh, India, he founded a monastery called Thubten Dorje Drak Evam Chokgargi Chode, which has been of great service and an inspiration to the people of Tibet, India, Nepal, Bhutan, Sikkim, and Ladakh. Both lamas will be greatly missed, and one prays that they will return swiftly to continue their enlightened activity. After a break for lunch on this day dedicated to remembering and appreciating teachers, the setting of the stage has been shifted again. Below the great Buddha is the statue of 1st Karmapa, Dusum Khyenpa, and beneath him is the 17th Karmapa’s throne, in front of which sits an elegant wood chair. It is for Khenpo Karthar Rinpoche from Karma Triyana Dharmachakra in New York, to whom the Karmapa will give a long life blessing. “Khenpo Karthar Rinpoche fulfilled the 16th Karmapa’s wishes by moving to the United States; setting a peerless example, he spent decades taking on great responsibilities and making tireless efforts for the sake of others. Today I’d like to take the opportunity to express from the depths of my heart my gratitude to him and also to rejoice in all his activity." 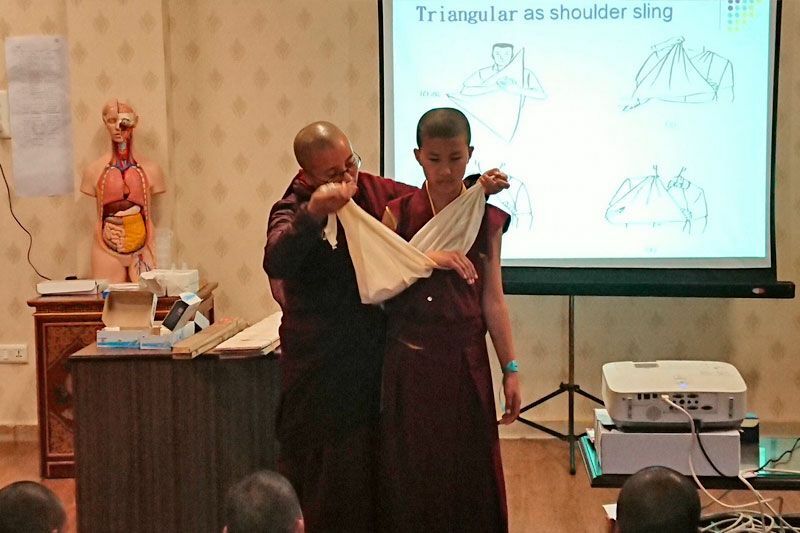 “Khenpo Rinpoche is now in his 90s and, from a Tibetan perspective, this is considered the age of a fulfilled life, so it feels a bit uncomfortable to make long life offerings to him. It is true, however, that those who have donned the armor of powerful aspiration prayers and bodhichitta for the sake of the teachings and living beings, even if they remain for only a few hours, create an immense benefit for the world. 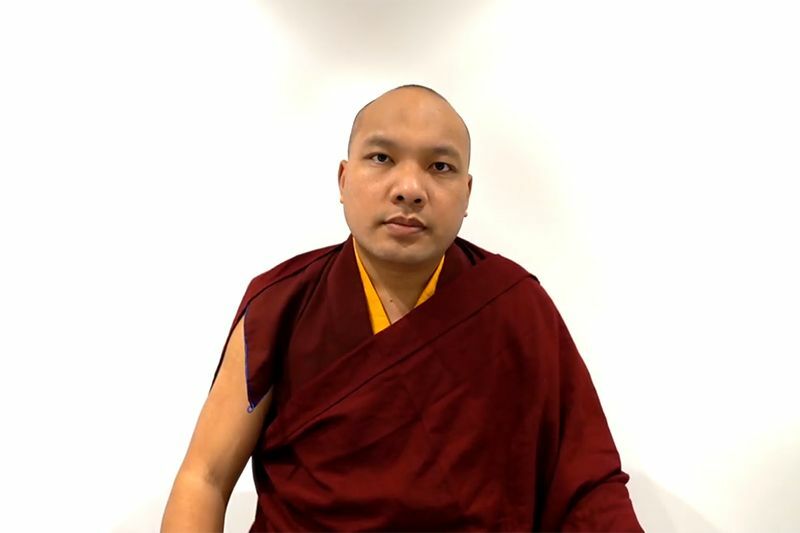 I make the aspiration prayer that for the universal glory of the teachings and living beings, that all of Khenpo Rinpoche’s aspirations without exception be naturally accomplished." “For Khenpo Rinpoche’s long life, I have spontaneously composed a verse, which we can all chant together seven times." Venerable, and good, and accomplished the wishes of the Karmapa. May this incomparable master live long. Khenpo Rinpoche came up to the Karmapa’s throne and His Holiness bestowed on him the Gampopa hat and three robes with a graceful and powerful gesture, and concluded by blessing three times the top of Khenpo Rinpoche’s head with his hand, perhaps the best gift of all. Those who would like to know more about the wonderful life of Khenpo Karthar Rinpoche, can find his life story in the Amrita of Excellence, published by KTD Publications and available from www.namsebangdzo.com. Email: store@namsebangdzo.com.